The flower map for South Gare can be found using the following link. 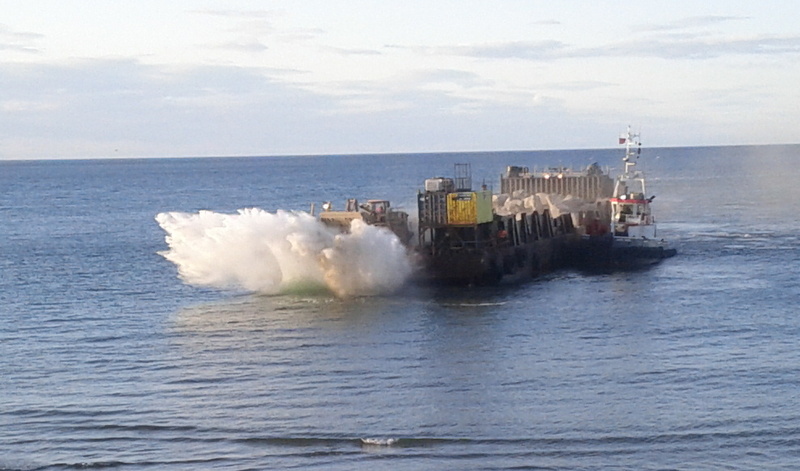 An absolutely sparkling, sunny, summer morning…but windy. We started by the roadside admiring Bloody Crane’s-bill, as you do, which was in full magenta flower and adjacent to blue-flowered Geranium x magnificum a sterile garden crane’s-bill so certainly the result of someone dumping garden rubbish and coincidently not recorded at South Gare before: A new record a few metres from where the cars were parked…and it got better. But first a little history lesson – I brought along maps and everything; unfortunately no-one had reading glasses, fortunately it’s the thought that counts. South Gare was built from waste slag from the steelworks starting in 1861 and finishing in 1888. So everything we saw growing arrived after that…before that date it was mud flats or sea depending on whether the tide was in or out. 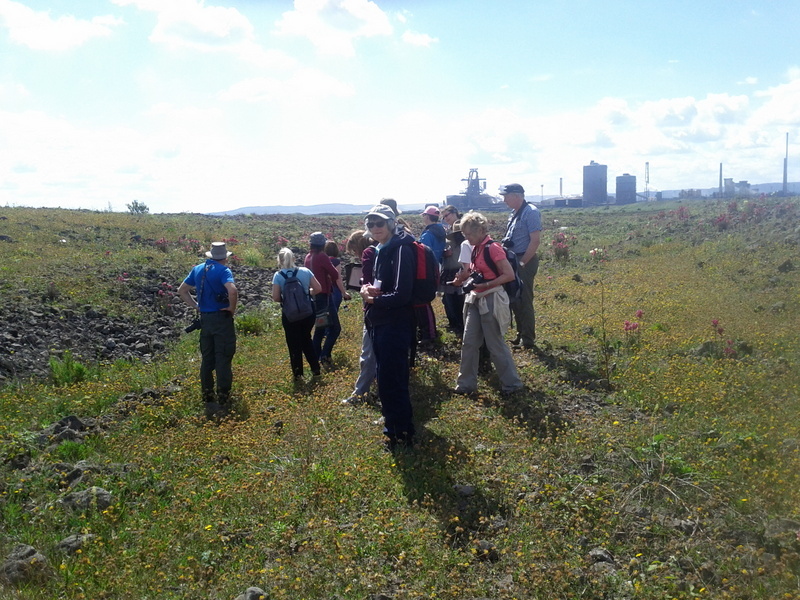 We walked onto an area of weathered slag where an interesting mix of calcareous and garden plants grow together. There were spectacular displays of the garden Snapdragon, some Broad-leaved Everlasting-pea just starting to flower and some fine Sweet-Williams. Of the natives were Kidney Vetch in the final throws of flowering, Blue Fleabane, Yellow-wort and Fairy Flax. Ploughman’s-spikenard, though still in bud, was a pleasant surprise here. 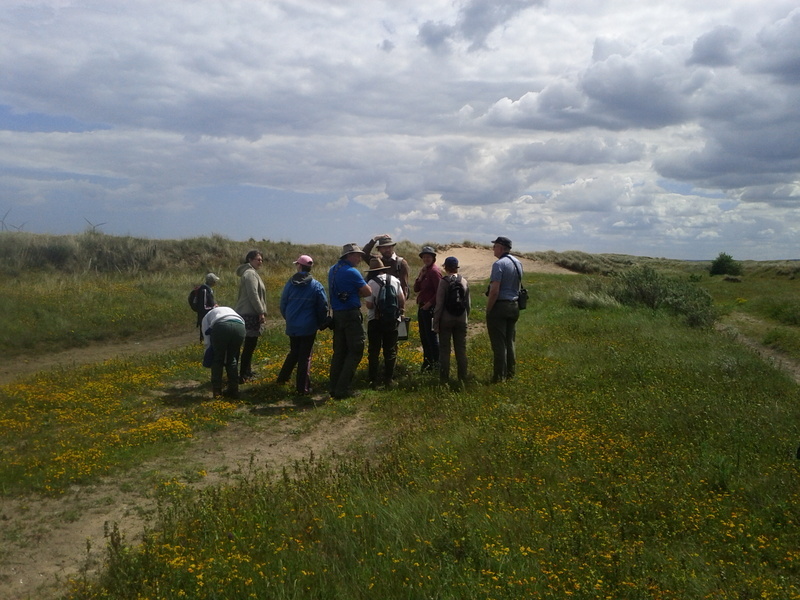 Anyway, when we got to the dune slack we were treated to a splendid display of yellow Common Bird’s-foot-trefoil dotted with the deep purple of Northern Marsh-orchid and on closer inspection the tiny soft pink flowers of Sea-milkwort and the subtle interest of a small carpet of Few-flowered Spike-rush. From there we headed over the dunes towards the sea, pausing to admire the various Oraches that were growing in the sand before walking along the shore back towards the Gare. 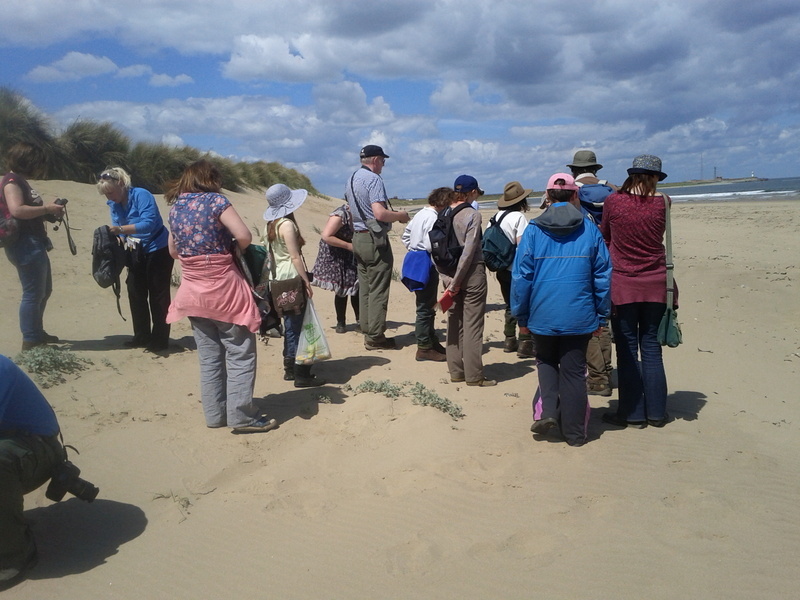 Just before arriving we nipped onto the dunes up and down as I thought I’d remembered where there was some Sea Holly growing. 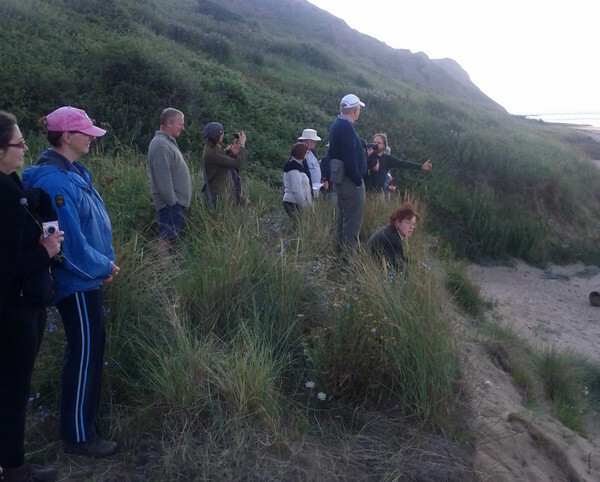 I nearly was right…it was the next dune nearer the sea, but we got there in the end and it was much admired. It is only recently here, having been recorded in 2001and since spread a little. And then over to the Gare itself where a rare white-flowered form of Common Restharrow was flowering near to some Bee Orchids on the thin layer of sand that had accumulated on the concrete edge. 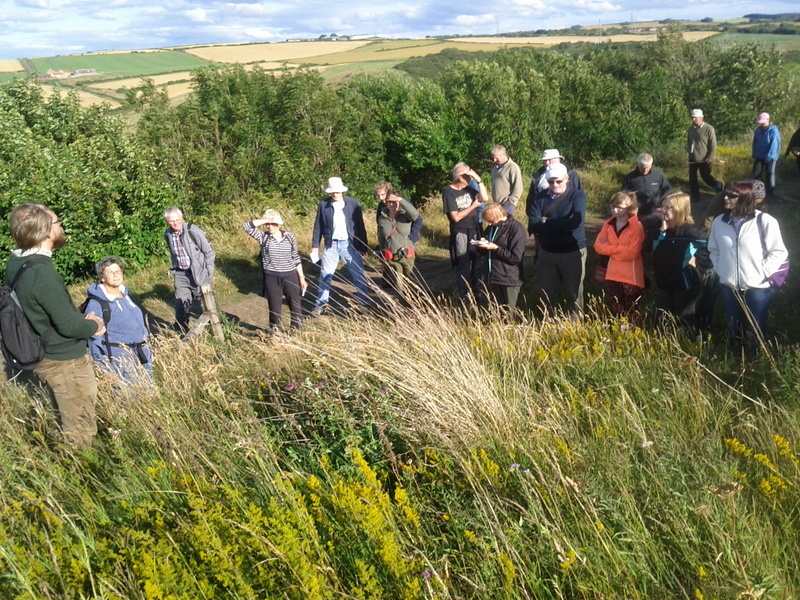 We all gathered at the car park and stared transfixed (first plant we looked at, so people are bound to be genuinely interested) at the Hoary Mustard behind the crash barrier which was a mass of quite small nondescript yellow flowers. If you’ve been following the saga of the Hoary Mustard over these reports you’ll be delighted to know the pods have developed to such an extent that there is no doubt that it’s Hoary Mustard. We walked past the church to see the white and pink funnel-shaped flowers of Field Bindweed, the White Stonecrop growing on a sprinkling of soil on top of a tarmac road, and growing in the cracks Common Mallow now in seed and then Mugwort in flower (the flowers were pale green so it was hard to tell). 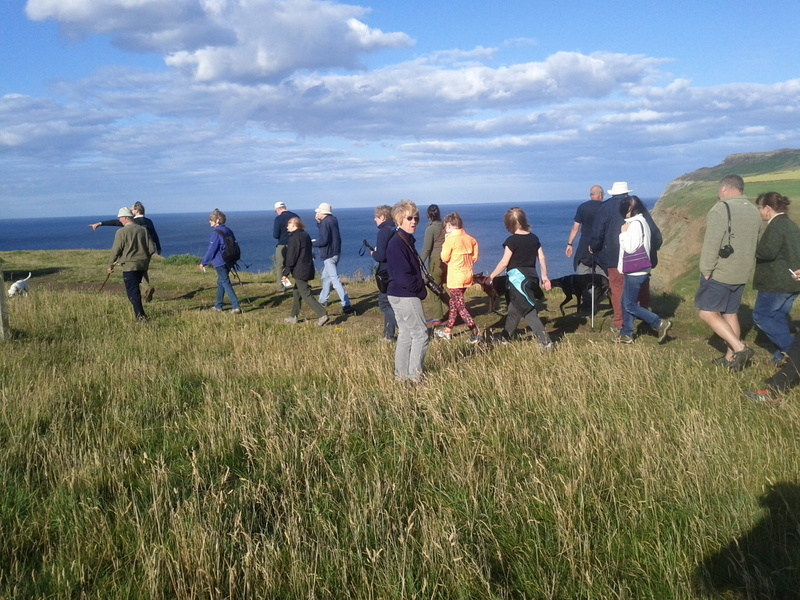 Further along towards the cliff edge and we stopped to look at the wildflowers that had been seeded on this area when it was transformed from an industrial site more than 25 years ago. Lady’s Bedstraw was at peak flower with large patches of tiny yellow flowers throughout punctuated by taller plants of Greater Knapweed (purple), Field Scabious (blue) and the odd Common Knapweed (also purple and we looked at the differences between it and Greater Knapweed…because we could). There were still flower spikes of Pyramidal Orchid to be seen although they had lost their namesake shape and were a bit more ovally-orchids to be honest; they still looked stunning. Down the slipway path towards the jetty was Tall or Golden Melilot and the tiny white flowers (and plants) of Fairy Flax. As we reached the raised sand-dunes we stopped we stopped just at the edge to sniff the Marsh Fagrant-orchid and then went on to discern the difference between Yarrow, Wild Carrot, and the very beautiful Burnet–saxifrage which all had very similar white flowers and by similar I mean pretty much the same unless you look closely and since the whole point of the walk was to look closely I made people look closely until they could work out which was which. 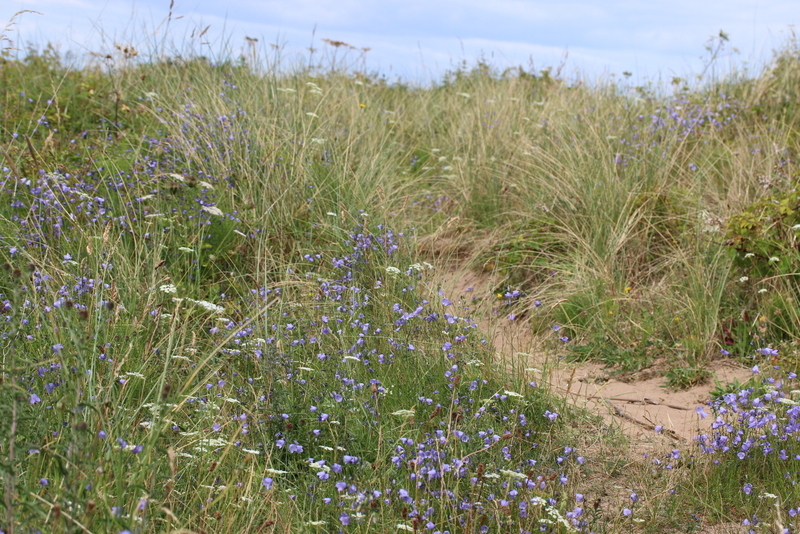 At the back of the dunes were large patches of tall pink-flowered Hemp-agrimony and some smaller Common Fleabane just opening its yellow daisy-like flowers. 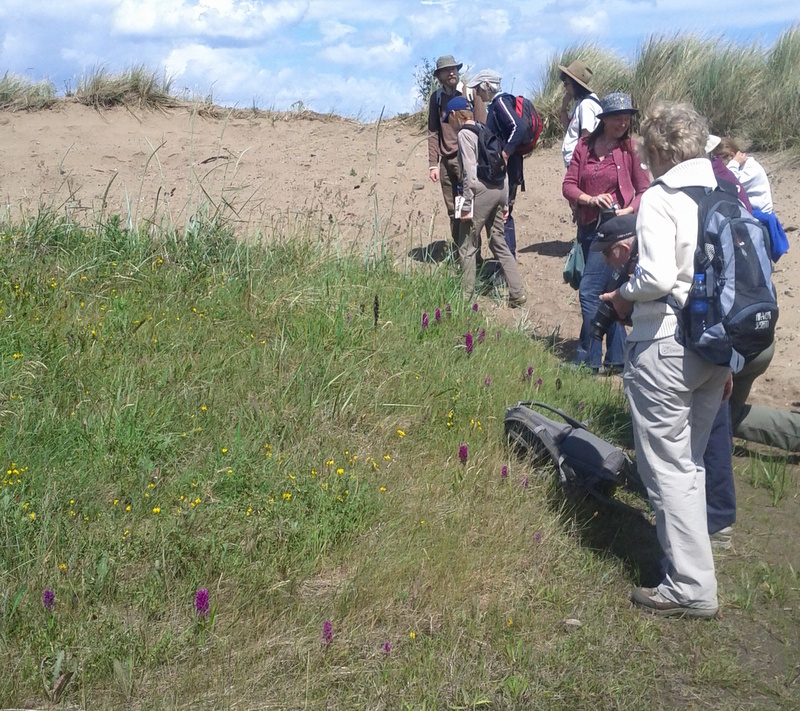 A swift walk to the end of the dunes then through masses of Burnet-saxifrage only to be met with wave upon wave of Harebells as we topped a dune and went down the other side. I’ve never seen so many in one place and of such variation in colour – from pale blue to dark blue (even a white one) – and form as some bells pointed upward and were quite small, and others large and hanging as we would expect; a total delight. I hopped down onto the beach and brought back a sample of Frosted Orache and Sea Rocket (which was growing all along the very top of the beach in a line) for everyone to look at closely and then as we were meandering back a couple of boats appeared and so we stopped to watch as huge boulders were pushed off the end into the water to be later used to reinforce the pier, before wending our way in the evening sun back up to where the cars were parked.